In December, I travelled to Washington, D.C., to cover President Obama’s Inauguration for MTV News. I was managing the operation, for the most part, but broke ranks one afternoon to interview one of my artistic heroes, Shepard Fairey. USA Today’s Pop Candy Blog linked to the resulting article. So I sent its editor, Whitney Matheson, a thank you email. We talked about our mutual love of R.E.M., and agreed to grab beers sometime, then got sucked up into the cycle of our respective lives. Fast forward to two week ago. I sent Whitney an email about our “Mister Rogers & Me” fundraising efforts over at kickstarter.com. I had a hunch she’d get it based on a) my experience with her appreciation of Mister Rogers in general and b) her support of my buddy Brian Linder’s Save MIster Rogers’ Neighborhood campaign. 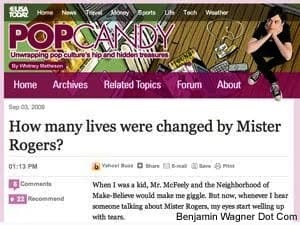 Tags: Mister Rogers & Me, R.E.M.